Glance at the cover and you’ll see a flaring spiral galaxy sizzling through the tranquil of deep space. But wait till you hear the rhythmic sparkles and intense orchestra colors on this fireball of a CD! Composer Ann Millikan creates shimmering textures that leap and bend in a dynamic balance of blazing heat with well-crafted cool. If the title of this orchestral album refers to nocturnal music, it’s one turbulent night. With the strength and purpose of an opera, Trilhas de Sombra is a spirited three-movement work taking you on Kira’s Journey into another world. Based on a story by the composer, Trilhas de Sombra (“Shadow Trails” in Portuguese) centers around its middle movement, Snow World. A dazzling panoply of layered clusters and extended instrument techniques, it swirls and rumbles like an icy sphere inhaling and exhaling snow flurries. The third movement, Battling Oligarn Batrone, rains molten thunder and the Bulgarian National Radio Symphony Orchestra (under its conductor Grigor Palikarov) can really let rip. Fiery waves of color streak about the orchestra like stellar light, reaching a terrifying climax. The slow tiered ending with a gorgeous flute solo is unforgettable. Powerful and fierce, Landing Inside the Inside of an Animal never backs down. The lush textures are reminiscent of Snow World but far more restless and volatile. A swirling storm dissipates into dark and turbulent layers where rapid bassoon and bass clarinet lines thrash in and out. A plaintive piccolo solo ascends from the darkness, igniting a festive orchestral display that erupts into a final joyous celebration. Saint Paul-based composer ANN MILLIKAN writes concert music for orchestra, chamber ensembles, choir, and interdisciplinary projects involving theatre and dance. Her music is “characterized by high energy and a quirky inventiveness that defies easy categorization...Her scoring is clean and transparent and her felicities of orchestration are among the most attractive elements in her work.” (Stephen Eddins). Millikan’s debut album, “The Music of Ann Millikan featuring the California EAR Unit” is also available on the Innova label. The title track (13 minutes) is a splendid sort of quasi-concerto for piano and chamber orchestra, it's melodious yet original, well written and darn well orchestrated." This is some really beautiful dynamic classical music with elements of jazz. Really wonderful music, worth checking out. Negli Stati Uniti esiste un consistente numero di interessanti compositrici, il cui valore tende a scalfire il predominio maschile in questo campo. Tra queste va sicuramente annoverata Ann Millikan. Il presente cd Innova ci fornisce un quadro esaustivo della sua fertilità creativa e della sua versatilità musicale. Di grande impatto evocativo è in particolare il primo brano, che dà anche il nome al cd, ovvero Ballad Nocturne. Si tratta di una ballata per pianoforte e orchestra in cui sonorità jazz (genere che la Millikan ha suonato per anni, e che ama tuttora) dolci, distese e cullanti si sviluppano in un discorso musicale quanto mai fluido, sensuale, quasi liquido, profumato di nostalgia e mistero. Lo definirei un tipico esempio di jazz onirico, etichetta da me coniata e che mi è venuta in mente ascoltando un brano scritto da un altro grande autore: Lions (a Dream) di Ned Rorem, per quartetto jazz e orchestra. Straordinaria, come sempre, la prova di Emanuele Arciuli, pianista italiano che possiede una particolare e provata sensibilità per le qualità 'spaziali' della musica americana. Il secondo brano contenuto nel cd è anche il più lungo, e del primo mantiene il carattere onirico, che qui si presenta però assai più frastagliato e tumultuoso, perlomeno in alcuni frangenti. Il terzo e ultimo brano, infine, dopo un inizio oscuro e tenebroso, si apre a atmosfere solari e festose, grazie anche all'utilizzo, scaltro e mai banale, di ritmi sudamericani, che ci trascinano in un gioioso e coinvolgente vortice conclusivo. In the U.S. there is a significant number of interesting female composers, whose value tends to undermine the male dominance in this field. Ann Millikan is one of these. This Innova CD gives us a framework which testifies her creative fertility and musical versatility. The first track is, as the title (Ballad Nocturne) suggests, very evocative. It is a ballad for piano and orchestra in which jazz sounds (don't forget that Millikan played jazz music for years and still loves it) sweetly stretches and develops into a lulling musical discourse, which is very fluid, sensual, almost liquid, perfumed with nostalgia and mystery. I'd call it a typical example of dreamlike jazz, a label coined by me and that came to my mind while listening to a piece written by another great author: Lions (A Dream) by Ned Rorem, for jazz quartet and orchestra. Extraordinary, as always, is the performance of Emanuele Arciuli, an Italian pianist who has a particular sensibility for the 'spatial' qualities of most American music. The second track on the CD is indeed the longest, and maintains the same dreamlike character, which here appears, however, much more jagged and tumultuous, at least in certain junctures. The third and last track, finally, after a dark and gloomy beginning, opens itself to sunny and festive atmospheres, thanks to the composer's original utilization of South American rhythms, which lead us into a joyful and exciting final whirl. Ann Millikan’s music is a wonderfully eclectic mix of several contemporary compositional styles and yet Millikan retains an individual and consistent voice throughout each work on this Innova CD. Ballad Nocturne, (2009) for piano and chamber orchestra, puts jazz harmonies and figurations through a Druckman-esque prism. Neither straight-ahead jazz nor purely-abstract instrumental music, this piece encapsulates Millikan’s musical personality: that of a synthesizer. Disperate elements flow together and mix in seamless compositions. Around the 8 minute mark of Ballad Nocturne, time simply stops as high strings and a repeated high piano figure float over a slightly-disturbed walking piano bass. The piece switches gears from pseudo-lounge to Morton Feldman without dislocating the listener’s eardrum. Instead of ending the piece at this moment, which I fully expected, a more traditional jazz ballade lugubriously emerges and clarifies everything we’ve heard previously with the subdued juxtaposition of earlier elements. Perhaps jazz transformations aren’t your thing. No worries there, because the orchestral triptych Trilhas de Sombra, (2009) a programatic work based upon a story written by Millikan’s niece, feeds any needs you have for good ol’ American atonal expressionism. Except, of course, when Millikan doesn’t need such language to express the ideas in the story. Gestures and textures tend to abound instead of melodies but the music is still a cohesive unit that moves in a single, unified direction. The melodies that emerge are long and fluid and showcased with solid and direct orchestrations. Millikan doesn’t get caught in the trap of being overly clever and instead crafts a wonderfully picturesque and programatic work and like many great programatic orchestral showcases, Trilhas de Sombra doesn’t come across as a movie soundtrack without the visuals. Unabashedly contemporary in sound, this is an approachable and enjoyable work that does not condescend to the listener. "Millikan is quite a fine storyteller. Snow World, the Klangfarbenmelodie-like center of Trilhas de Sombra, demands attention as do the Varèsian and Revueltas-like touches in the final movement and Landing inside the inside of an Animal. The orchestra and piano balances in Ballad Nocturne might provide a stumbling block to some listeners. For living composers, orchestral performances are hard to come by. Millikan should be pleased by the way the Bulgarian National Radio Symphony Orchestra traverses her strange mix of dissonance and sambas." Prolific composer and master orchestrator Ann Millikan rallies the forces of the Bulgarian National Radio Symphony and Italian virtuoso pianist Emanuele Arciuli for a captivating journey that bewitches the mind and liberates the spirit in her new release, Ballad Nocturne (2010). While the composer's musical style defies a facile description, it is exemplified in her command of the richly diverse sonorities gained through the incorporation of contemporary compositional methods, her expert and vivid orchestration, and the infusion of jazz melodic and harmonic material. Funded by the Argosy Foundation Contemporary Music Fund in 2007, Ballad Nocturne consists of three stylistically-diverse chamber and orchestral works: Ballad Nocturne (2009); Trilhas de Sombra (2009); and Landing Inside the Inside of an Animal (2008). The title composition for piano and chamber orchestra was commissioned by the Orchestra Filharmonica di Torino as a showcase for the meticulous yet impassioned pianist, Emanuele Arciuli. Widely esteemed by American composers and an acknowledged champion of twentieth and twenty-first century American music, Arciuli has inspired compositions by Babbitt, Bolcom, Crumb, Daugherty, Harbison, Rzweski, Torke, as well as Millikan. In this respect, Ballad Nocturne represents the perfect vehicle for the talents of the artist. Outwardly conforming to the rounded binary form of the Romantic lyrical nocturne and the intimate narrative style of a jazz ballad, Ballad Nocturne remains an ingenious postmodernist hybrid, in which the orchestra engages in a flirtatious dialogue with the piano. The striking modal language coupled with the vacillating jazz and atonal material is enhanced by string harmonics and bowed crotales. In the recapitulation, the haunting melody reappears accompanied by a disruptive walking bass line and then retreats into the night. The effect evokes mysterious images of twilight as the piano softly wanders into nothingness. The evocative and striking three-movement orchestral composition, Trilhas de Sombra (Shadow Trails), exhibits the exceptional ability of the composer to combine disparate musical styles, orchestral effects, and varied compositional methods in a spatial arrangement. Based upon Millikan's original fanciful narrative, which was written for her Brazilian niece, Trilhas de Sombra portrays a young girl of the Amazon and her journey through the Shadow Trails into the Snow World. As she travels through the deepest layers of this world, she arrives at the location where all sound originates and plunges her sword into the mountain. Magically, all sound is transformed and exists in abundance. For the musical depiction of the tale, the composer employs a distinctly expressionist approach, while using melodic material in conjunction with atonal methods. The most breathtaking moment of the composition occurs in the last few minutes of the third movement, "Battling Oligarn Batrone." After the terrifying climax, the exquisite melodic material returns in the orchestra accompanied by an imitative and impressionistic flute solo, brilliantly executed by the Bulgarian National Radio Symphony Orchestra and Yavor Jelev, respectively. The concluding composition, Landing Inside the Inside of an Animal, offers the listener an entertaining adventure into a labyrinth of diverse compositional styles. The static yet energetic atonal first section anticipates a virtual explosion into a musical celebration of Afro-Cuban dance rhythms and finishes with a samba, other dances, and a lively fanfare. This restless piece features a relentless bass clarinet and bassoon interplay, which serves to increase the interest and tension, just before the fiery concluding festivities. The Bulgarian National Radio Symphony Orchestra, directed by Grigor Palikarov, delivers a nuanced performance through its skillful and dynamic articulation of the distinct musical styles embedded in the array of musical material. 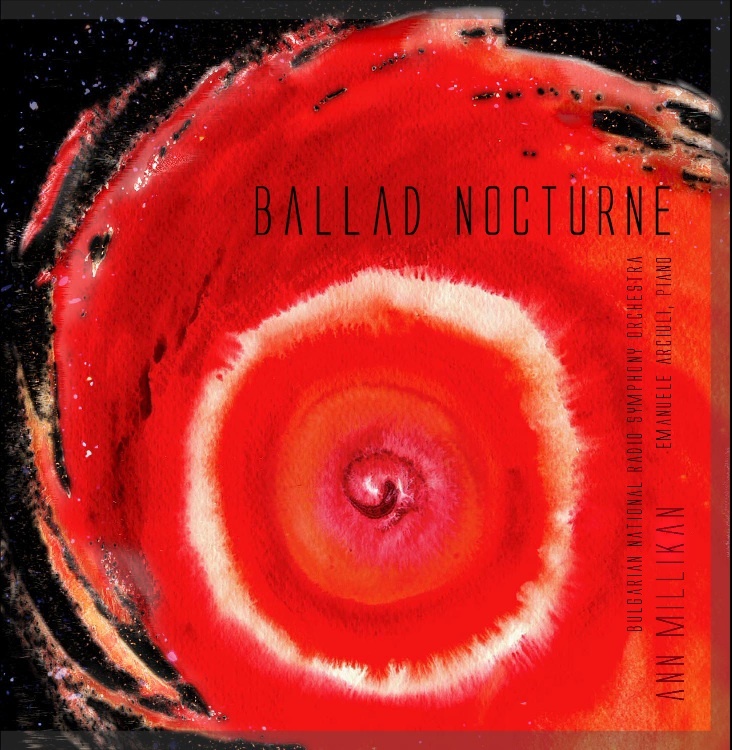 The compact disc, Ballad Nocturne, stands, not only as a significant addition to the repertoire, but also as a testimony to the innovation and craftsmanship of the composer.